It’s a beautiful sunny winter’s morning here with about five inches of fresh snow that fell after sunset yesterday. I’m feeling happy right now, with coffee and a lovely day ahead of me, vindicated in my decision to go grocery shopping yesterday then soak some beans. My snow dog has curled up now on the deck outside my kitchen watching over our green space beyond, and my cat has curled up on my bed. It’s time now for me to put on a pot of white bean and kale soup, then go play ball while I shovel my driveway. 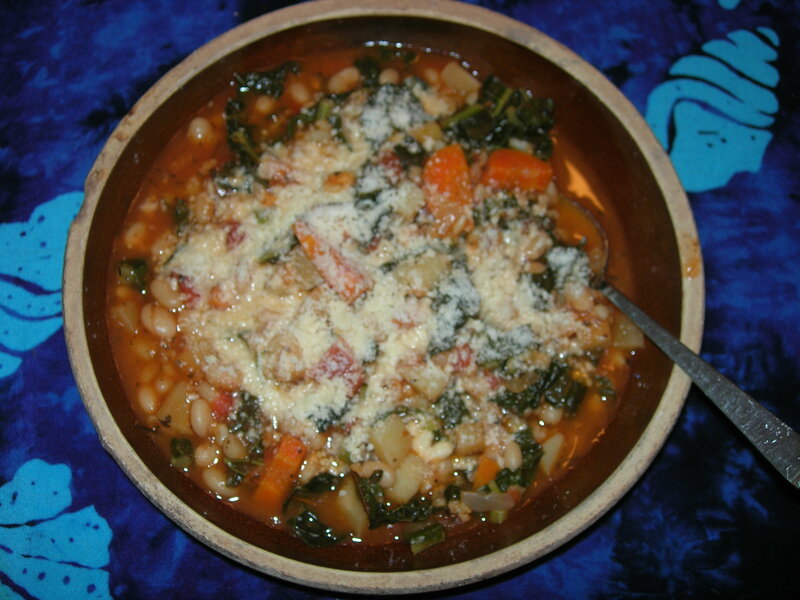 This is a recipe I first made years ago– over time I have found that a 50-50 mix of Great Northern and Cannellini white beans provides the most delicious flavor and texture. Rinse then soak beans overnight, or for at least 8 hours. Drain and rinse well. Cover with fresh water, bring just to a boil, then simmer for about 1 hour until beans are just becoming soft. Remove from heat. Using large 5 quart soup pot with lid, saute onion in 2-3 T olive oil for 2-3 minutes, then add garlic and potatoes. Saute for 3-5 minutes, stirring until potatoes are lightly browned. Add butternut squash, rutabaga, carrots, celery and spices. Stir all vegetables until spices are well mixed. With pot over medium heat, add canned tomatoes in their juice, apple cider vinegar and basmati. Stir in 5 cups fresh water that is close to but off boil. Partially cover and monitor heat until soup comes almost to boil, then reduce heat to medium low, cover and cook for about 30 minutes to an hour. Checking water level occasionally, add more water as necessary. Continue to stir and check beans, rutabaga, and carrots for doneness: keep simmering until each are soft but not so mushy as to fall apart. Add salt and pepper to taste, then add chopped kale, cover and cook for another 10 minutes or so until kale is bright green and lightly cooked. Serve topped with parmesan cheese. Makes 8-10 servings. Freezes well. Note on Bouillon: Beware! Many brands of bouillon cubes have partially hydrogenated oils, palm or cotton seed oil, MSG, and a grossly high serving of sodium- all things to be avoided, certainly not added to your food. This entry was posted in Gluten Free, Soups, Vegan and tagged butternut squash, comfort, kale, Root Vegetables, vegetarian, warming, white beans by Jill. Bookmark the permalink.